Jacob's Crackers: THE LAST SUPPER " A fiery and sublime Chilli "
Originally from Texas not Mexico as is widely believed , the famous Chilli Con Carne or Tex Mex Chilli has been an international favourite for ever . In Mexico , where this dish doesn't actually feature the Red kidney beans we are used to , Instead chopped apples or plantain is added to provide sweetness and sometimes the inclusion of Cocoa adds colour to the dish and gives a subtle smokey flavour. But the beans at the end of the day, add substance and protein without the need for heavy Carbohydrates . 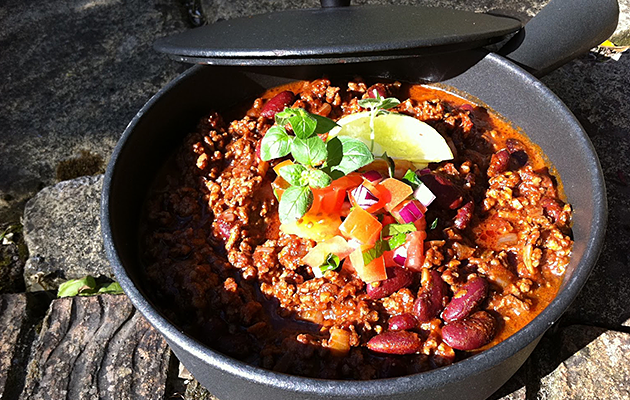 A good Chilli is not just " a little bit of this and a little bit of that ". If this is going to be your starting point, then you will reap a bit of this and a bit of that . Don't say that you haven't been warned . The trick in preparing a good Chilli is all in the ingredients and spices and best made the day before as it will intensify the flavours . The following ingredients is a must for this recipe. The Smoked Maldon Salt and The Smoked Paprika add smokiness to the dish . Fresh Oregano or Dried Mexican Oregano for aroma . I also use a mixture of Lean Mince Beef & Round steak for texture . Pre Heat Oven to 120 c.
In a large Casserole , gently saute the onions in 2 tbsp of oil for about 5 mins , until translucent . Add the Chillies and garlic and fry for a further couple of mins . Add the beef and star anise, continue to fry , breaking up any lumps until well browned all over. Do this quickly and fast as you want to seal the meat, preventing it to stew into it's own juices. Now add in all the other spices and chilli paste, stirring well. Add the chopped tomatoes , herbs , salt , pepper & lemon juice . Add the stock and bring to a simmer , Cover with a lid and cook in the oven. After 2 hrs , stir in the beans and check the seasoning, sometimes , you may have to add a bit of sugar for extra sweetness depending on the sweetness of your tin tomatoes , and cook for a further 45 mins - 1 hr until the beef is tender . You could also cooked this in a slow cooker for 6-8 hrs . Now , put your feet up , sip on your margherita as Dinner is taking care of itself . BLISS !!!!!!!!! Serve with Boiled Rice or Baked Potatoe , Hearty Green Salad, Sour Cream , Tomato Salsa and Corn Chips .